Police have voiced anger and disgust after a small child found a package of drugs in Co Armagh. The PSNI said the package was discovered in the Woodside area of Portadown. However they were grateful it was handed over to police. In a statement the PSNI said: “It is disappointing to have to put this post up but the sheer recklessness and disregard for the rest of us displayed by drugs users makes it necessary. “The post is not about causing fear or panic either but it is about raising awareness of this occurrence so that parents especially can speak to their children and warn them of the dangers of these items. “The package shown was found by a small child in the Woodside area of Portadown and thankfully, handed to us. The words to express the anger and disgust all reasonable people should feel toward the drug user who left it there are surely in your mind now. “Please speak to your kids, advise them never to touch anything they find in the street but rather to tell an adult, harm caused to one child is one child too many. 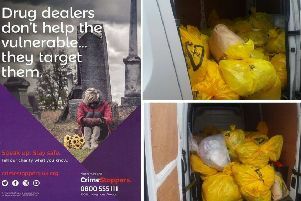 “If you know anything about drugs use or supply please contact us on 101 or contact the independent charity Crimestoppers on 0800 555 111, 100% anonymous, always. Deputy Mayor of Armagh, Banbridge and Craigavon Council Cllr Paul Duffy has condemned those responsible for leaving drugs in what appears to be a child’s toy container in the Woodside area of Portadown. The Sinn Féin Cllr said: “The container and its illicit content was found by a child. Thankfully it was handed to an adult before anyone came to harm. “Those responsible are a real and present danger to children and adults in our community.